This paper outlines the five simple steps you can take to help prevent sensitive information leakage from your organization, while keeping up with the rapidly evolving regulatory environment. The average employee sends and receives about 29,000 emails per year. One in every 20 of those emails contains “risky” data – from sensitive attachments to social security numbers to protected health information to valuable corporate secrets that set your organization apart. All of this risky data can become toxic to your company if it’s hacked or suffers a breach – causing reputational damage, customer loss, heavy fines, and decreased competitive edge. 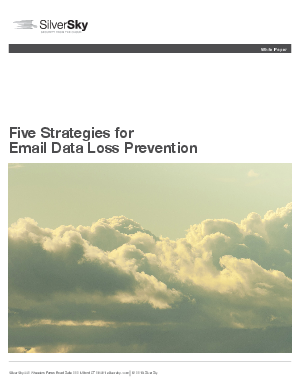 SilverSky offers a game-changing Email Data Loss Prevention (DLP) solution, run on IBM SoftLayer, which brings content-aware policy capabilities normally reserved for complex enterprise DLP solutions. Download this paper to learn more.